It works great. But I cleared off all the Tax from the items, because it didn’t add up right when I got up to the check out. So I take a calculator with me to add the tax to know what I’ll be spending at the checkout. Hi Ivadle, thanks for your feedback. indicate a reorder frequency. If I put in 2 weeks then it will automatically be added to my shopping cart 2 weeks after my last purchase date. Any chance of that feature? Hi Sharon, thanks for your question. 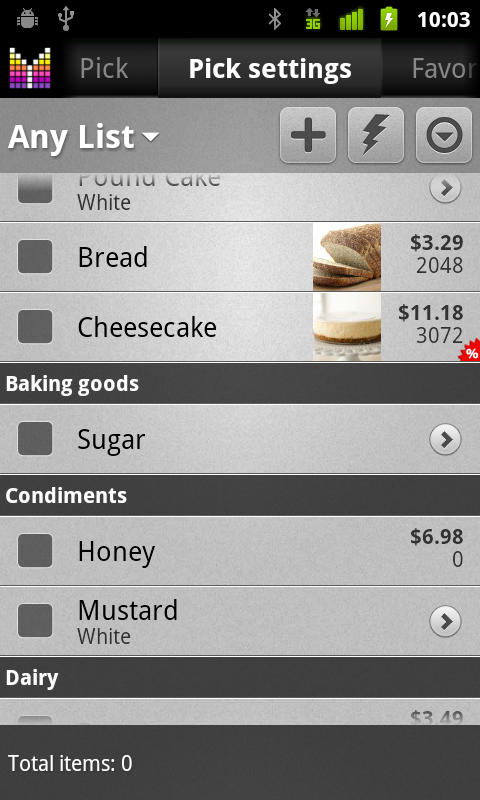 Yes, we plan to have “reoccurring items” feature in Pantry Manager. Thanks! 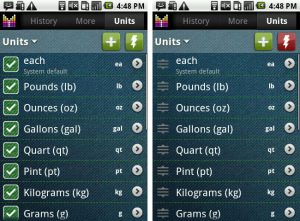 While editing Units of measure, there is a field (I have the spanish version) that reads Increment, what is this for? Also there is a field named: Relation basis (I am translating in Spanish says: Relación base) What is this field for? Hi there, thanks for your question. The “Increment” field allows setting the “step” by which item Qty gets changed when you tap “Plus” or “Minus” buttons under Edit item tab or in Edit mode of a shopping list. As for Base ratio field, it allows you entering price in grams and have your Unit Price per kilogram. I’d recommend seeing field values of “Grams” units. 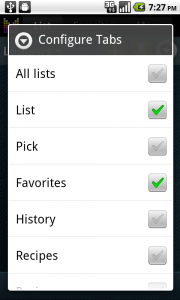 How can I unsubscribe from the list? Love this app but am unsure of all of its functions. When adding new items, the default is Pet Supplies (aisle?). Would prefer this default to none or other category, or even fruit and veg. Can you direct me to make this global change for adding any new item? Thank you! Ang, thanks for your feedback and your question. Kindly note that a new item should be added to the “Other” aisle by default. Could you please let me know item names which end up in Pet Supplies aisle? Also, any chance that you renamed aisle “Other” into “Pet Supplies”? Thanks. I would like to be able to have the tax be configured on the price of the item and not the tax after coupons are applied. Thankyou. Tiffany, thanks for your question. Kindly note that you can apply tax before discount after adding coupon to an item. Just tap Coupon / Discount field again and choose “Apply tax before discount”. Please let me know if you have any further questions. How can I get this to be exact at the checkout. Our tax is 8.8%. 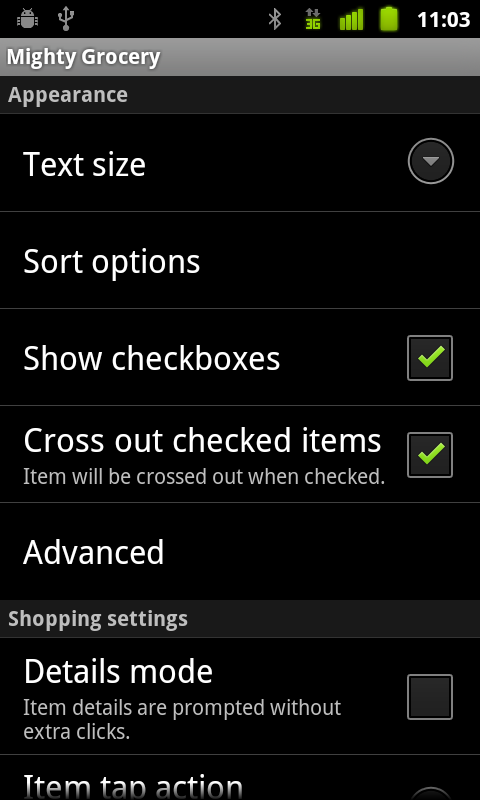 If I put the tax for each item then when I get up to the checkOut its totally off. 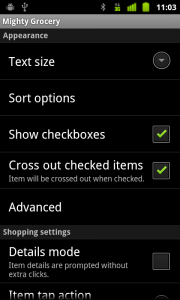 But if I don’t put it on any item then when I get to the check out I have to use the calculator to see what its gonna be when I get up there.then its right. Iva, kindly note that some of your items may be non-taxable, therefore if you apply tax on every item, the total may be inconsistent with your receipt. If you want us to have a closer look, please send a photocopy of your receipt to hi@mightypocket.com Thanks! When I buy liquor at favorites I saved in quantity by liters. For example: saved Vodka 0.75 litres. Put the price and coupon. When I want to add quantity (let’s say I want to buy six bottles) application starts adding by porters, not items, and its own incrementation. 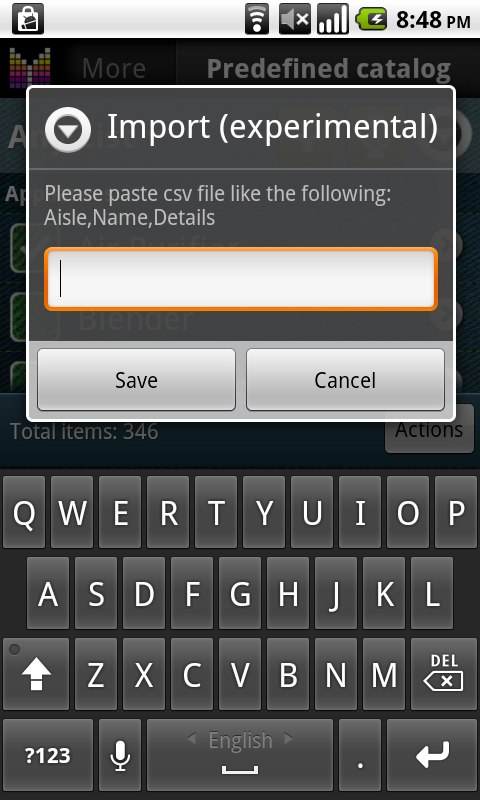 I suggest to have option for how to increment, buy item or quantity. Yuriy, thanks for your feedback. Kindly note that you can change individual increment rate for an item by long-tapping plus or minus button on Edit item screen. However, I’d recommend entering “0.75 l” in item details, and having item quantity as “1 bottle”. If I do it the way you suggested (put unit as bottle, and .75L as comment) then prices comparison will not work, because you avoid compare by price for a litre, not by bottle..
Yuriy, I see what you mean. There is a trick you might want to use to compare prices. Imagine you have items with names “Drink 0.75L” and “Drink 1L” both with bottles as measurement unit. The app won’t compare them by default because they have different names. 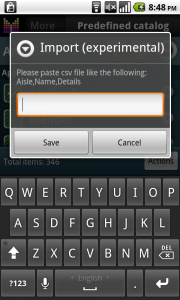 To work around this, you could assign Generic name of “Drink” to both items (long-tap Name field in Edit item screen). 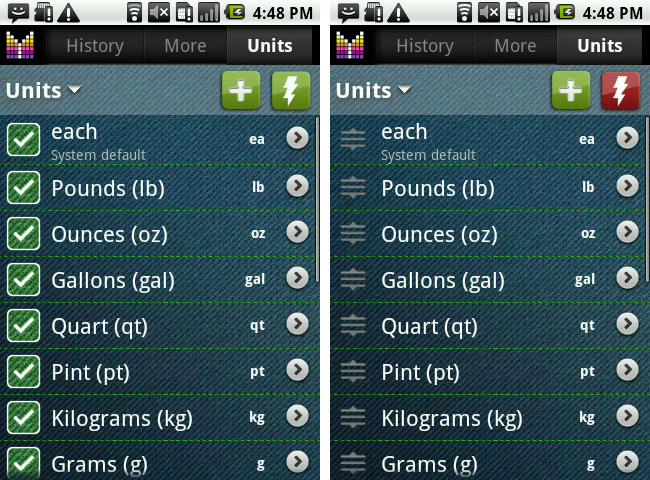 Then, if you set “Number of units” to 0.75 for item 1 and 1.0 for item 2, the app will compare prices correctly. To change Number of units, tap the rightmost field in price compare row. This requires a few steps to set up, but once done it will be easier to compare prices going forward. Please help me to set the favorite. Yuriy, could you please let me know what exactly are you having difficulties with? To make sure that your items are comparable, they need to have identical “Generic name” field value, and also they need to have “Number of pieces” value of 0.75 and 1.75 respectively. Here’s a little article about setting Generic name and Number of pieces in Price compare User’s Guide. 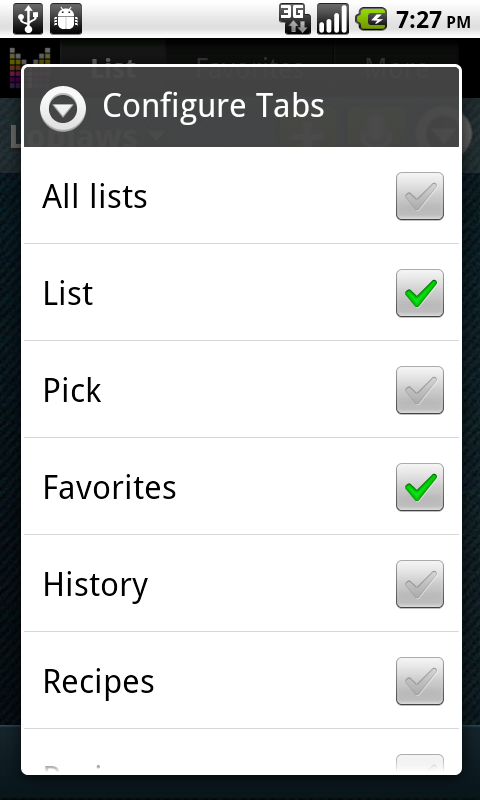 How can I add a new category, like Cosmetics, to the pick list catalog. I tried the help button, but it directed me here. Hi Jean, thanks for your question. 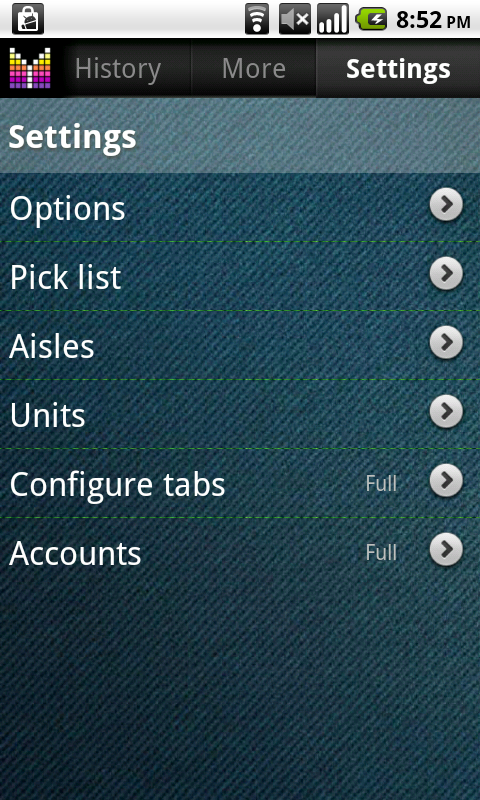 Kindly note that you can add new categories (aisles) under Menu –> Settings –> Aisles. 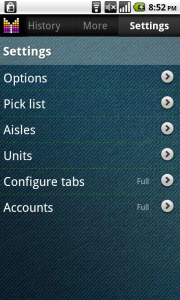 Please see Manage aisles User’s Guide for more details. I have a suggestion for an enhancement to this great application. 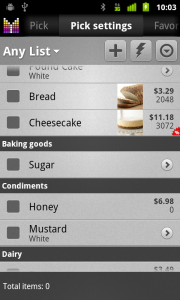 Adding a pantry field to store showing how many of a particular item there is in the pantry and then automatically updating the quantity in the pantry field when an item is checked out in the grocery list. So for example if I have 4 cans of Tuna in the pantry field and I buy another 3, when I check off the item in my shopping list, the pantry gets updated to 7 cans. Right now I use the Comment field to do this snd I update the quantity manually which tends of be tedious. Hi Wilfred, thanks for your suggestion. Kindly note that Pantry manager is one of the planned features and the behaviour you describe will be there as well.